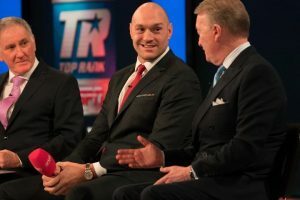 In a move that has clearly taken the boxing world by surprise, Tyson Fury, the man many still consider to be the lineal heavyweight champion of the world, has signed on with Bob Arum’s Top Rank Promotions. What makes this decision by Fury particularly surprising is the fact that discussions for a rematch between he and WBC heavyweight titlist Deontay Wilder, who Fury fought to a wild draw last December, have reportedly been going quite well. Now that Fury has aligned himself with Arum, who arguably is the arch rival of Wilder adviser Al Haymon, the rematch situation appears cloudy – at least for now. Also curious is the fact that Arum has no other top heavyweight in his stable. Fury, an enormous, colorful Englishman, has stunned the fight world before. At the end of 2015, he bested long standing champion Wladimir Klitshcko in Germany, to wrest the heavyweight crown off the Ukranian’s head. It was a fight few felt Fury could win, but his awkward, frustrating style clearly baffled Kltischko and ended up carrying the day the for the outspoken contender. After his great victory, however, Fury delved into a world of booze, drugs, food, and depression…only to finally emerge after two years and two tuneup fights to face the hard hitting American, Wilder. Even in the Wilder fight, Fury managed to stun people. He was dropped by a thunderous shot in the final round…only to get up off the mat and to close the bout in competitive fashion. With this latest news dropping, Fury once again has fans and analysts scratching their collective heads. Top Rank, however, is an esteemed, and powerful promotional outlet, helmed by the iconic, controversial, and wildly successful Arum, so it’s not as if Fury has gone off and signed with an obscure entity. Time will tell the tale.